By creating the Illusion collection, Sanijura intended to answer all the customer’s needs. 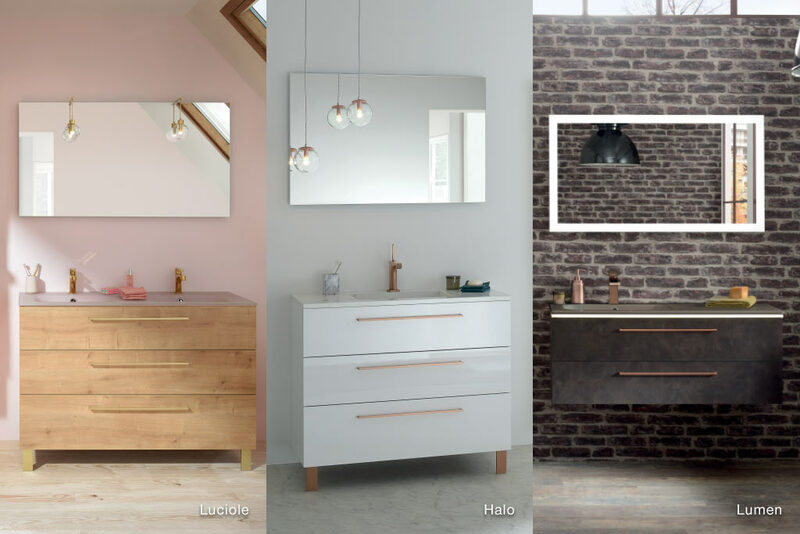 Illusion is a collection that offers 3 modular bathroom furniture ranges: Luciole, Halo and Lumen. The difference between these 3 ranges is their depth. Luciole is suitable for small bathrooms, with a shallow depth of 39 cm. Halo has a standard depth of 46 cm and Lumen offers a large depth of 51 cm. Luciole is a range adapted to small spaces because it represents a shallow depth of 39 cm. The Luciole furniture is convenient because it can be fitted into small bathrooms and allows to maximise the storage space. The Luciole range is also perfect for master bedrooms and guest rooms. Besides its shallow depth, Luciole has the same storage features as the other Illusion ranges. It goes from 60 cm to 140 cm of width. For the sake of space saving or for a simple aesthetic choice, the Luciole furniture can be wall-hung. For tidying-addicts, a version with 3 levels and 6 drawers is also available. Concerning vanity tops, double-sink fans will be able to find this option for the 120 cm and 140 cm furniture. However, Luciole is only available with integrated basins, as freestanding basins need a larger vanity top. This option is available with Halo and Lumen. Is it still necessary to introduce Halo, Sanijura’s flagship line? Halo is the first range of our Illusion collection and offers standard depth bathroom furniture (46 cm). This intermediary depth is convenient because it can adapt to both small and large bathrooms. With its 7 extra centimetres of depth, it offers a larger storage space than the Luciole range and a larger vanity top to display everyday products, such as toothbrushes, soap or hand cream. The Halo bathroom furniture is available in 6 versions, going from 60 cm to 180 cm, the largest version. Just like Luciole and Lumen, the Halo furniture is available in 2 versions: wall-hung for the 1 and 2 storage levels, standing for the 3 storage levels with 3 or 6 drawers depending on the chosen width. Concerning vanity tops, you’ll have the choice between a centred, right, left or double basin, according to your needs and the width of the furniture. You’ll also have the choice between an integrated or freestanding basin. La gamme The Lumen range is the extra-large solution of the Illusion collection. Lumen is perfect for beautiful volumes, large families or simply tidying-addicts. Lumen offers a 51 cm depth and a maximum height of 58 cm for the 3-level version. Just like Halo, Lumen is available in 8 sizes, going from 60 cm to 140 cm long. The storage capacity will allow you to gain as much room as possible in your bathroom but also in your master bedroom. 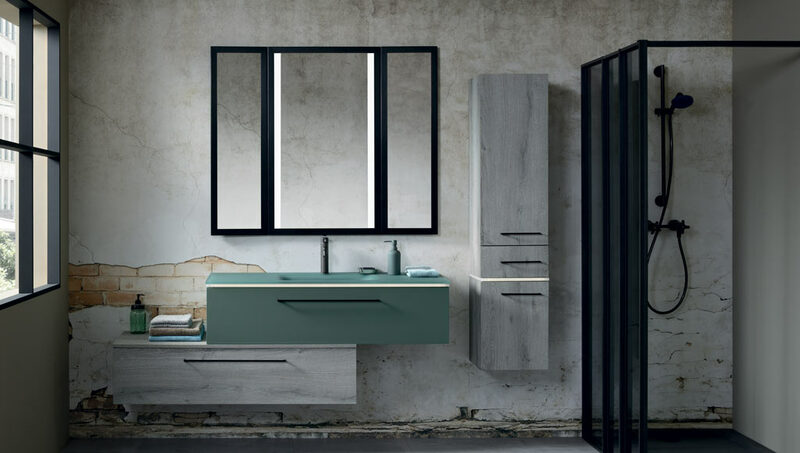 With an extra 5 cm depth compared to the standard range, the Lumen furniture can also be an interesting alternative to the vanity unit and storage unit combination.